Furst Igor, Strawinsky (Prince Igor, Stravinsky) by Mauricio Kagel (1931-). Contemporary Small Ensemble. For Bass Voice Solo, [0.0.English Horn.0.0-1.0.0.1], 2 Percussion, Viola. Modern. Score. Composed Composed: 1982. Duration circa 18 minutes. Published by Edition Peters (PE.P08601). Piano Rituals Nr. 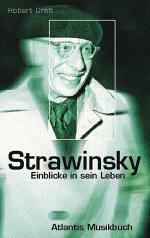 6 "Igor Strawinsky Rituals"